Do you have a missing tooth or missing teeth? Do you have a tooth that is cracked, broken, chipped, misshapen, discolored or has a lot of dental work in it? Do you have a tooth that you know needs to be extracted and live in the Montgomeryville, Lansdale, North Penn or surrounding areas? Having a beautiful smile is a confidence builder in the Montgomeryville area–there’s no doubt about that. And having a healthy smile gives you a feeling of well-being. If you have issues with missing teeth or other dental health problems, it could be that you may need dental crowns or dental bridges. Black and Bass Cosmetic and Family Dentistry in Lansdale can help with these issues! Dental crowns are made of porcelain and custom made for you. Though porcelain may sound fragile or breakable, a tooth crown is very sturdy, durable and long-lasting. We make a mold of your mouth at our office near North Penn, send the information gained from that mold to a lab and the lab creates a tooth crown that fits your smile–the right shape, the right size and the right shade. The tooth crown will look, feel and function just like a natural tooth. Feel free to eat, smile and laugh with confidence. Your tooth crown fits right into your smile, beautifully. A tooth crown is used to replace a tooth that has damage, especially if that tooth is at risk of getting a cavity. A tooth crown is an excellent choice if you have a tooth that doesn’t “fit” in your smile, such as a tooth that is misshapen or discolored. 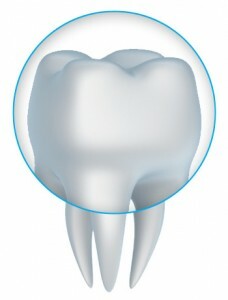 A tooth crown is used to top a dental implant. Dental crowns are used to secure dental bridges or implant supported dentures. If you have a missing tooth or teeth, an excellent restorative dentistry option in Lansdale is dental bridges. Dental bridges actually bridge the gap in your smile. They are custom made for you, so they look like your natural tooth. The dental bridges are secured on each side by a dental crown and are not removable, so there is no extra care required with dental bridges. If you would like more information about dental crowns or dental bridges at our office in Lansdale, call today! Our amazing dentists also serve the surrounding communities, including North Penn and Montgomeryville, too!